Water damage can be a serious problem for Dallas/Ft. Worth homeowners, and with Valentine’s Day right around the corner, it’s last thing you want to see. Even though our winters are relatively mild, freezing temperatures are still an occurrence. Having your pipes freeze can cause them to crack and burst – and the occasional ice and snow can contribute to roof and foundation leaks. Water can ruin metal, damage drywall, and lead to mold growth. Watch what goes down your disposal, as certain organic detritus can clog your pipes, causing water pressure to increase and burst your plumbing. Fatty and greasy substances such as lard, cooking oil, and bacon grease can harden and clog your pipes, regardless of the water temperature. Soap scum and starchy food residue can also be lodged inside your drain. If your sink is clogged, use a sink plunger to remove any initial build-up (kitchen sinks most commonly experience clogged garbage disposals). Use a drain snake to remove clogs lying deep within your pipes. With Valentine’s Day residing in winter, Dallas/Ft. Worth residents are still at risk for winter leakage. Be sure to clear you gutters and downspouts, along with sealing your doors and windows. More info about preventing winter leaks can be found here. Refrigerators and washing machines should be maintained regularly – and inspected closely for leaks. On the back of these major appliances are hoses connected to the water supply; these hoses should be examined every few months. Examine each hose for dripping, tears, loose connections, or knots. After an examination, be sure each hose is hidden and not at risk of being stepped on or tripped over. Although they seem harmless, plants and trees with invasive roots can burrow towards your plumbing and potentially cause unsuspecting damage. Trees such as willows, birches, and poplar all have invasive roots, and plants such as boxwood shrubs and ivy follow suit. Plan where you plant your vegetation and avoid having these close to your plumbing. Since your plumbing system is complex, identifying a burst pipe or water damage may seem difficult at first, but your water bill can be a notification. An high increase in your water bill may mean your plumbing is losing water in a certain area, and this lost water may be affecting an area you can’t see. Prevent water damage for Valentine’s Day and avoid the broken heart that comes with expensive repairs. 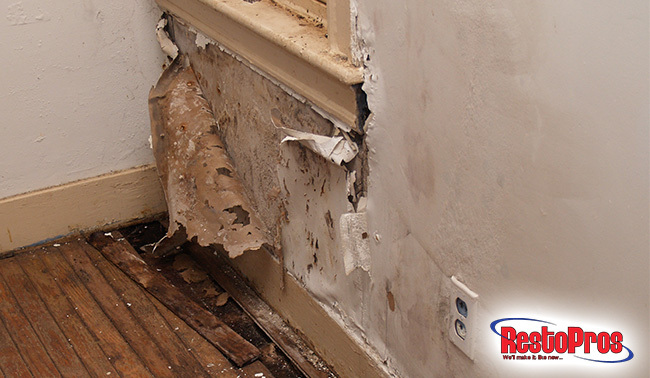 If you are experiencing water damage in your home, contact RestoPros immediately. Being the leading water and mold restoration company in Dallas/Ft. Worth, our water damage services ensure your home is restored to a safe and quality condition. Give us a call at 855-587-3786 to schedule an appointment and meet your local professionals. Happy Valentine’s Day!